INTRODUCTION: With the failure of medical management of Thoracic Outlet Syndrome, surgical intervention is indicated. The surgical management of Thoracic Outlet Syndrome has been dominated by the use of either a supraclavicular or transaxillary approach to first rib resection. There has been little reported on the use of a video assisted thoracoscopic (VATS) approach to first rib resection. OBJECTIVE: Demonstrate the feasibility and safety of a minimally invasive thoracoscopic (VATS) approach to first rib resection. METHODS: Between 2001 and 2010, 57 patients (40 women, 17 men) with thoracic outlet syndrome (TOS) underwent VATS first rib resection. RESULTS: Forty patients were females (70%) and mean age was 41 (22-59) years-old. There were no deaths. The mean length of stay was 2.6 days. Complications occurred in 5 patients (8.8%); wound infection (3), pneumothorax (1), aspiration pneumonia (1), and temporary arm weakness (1). 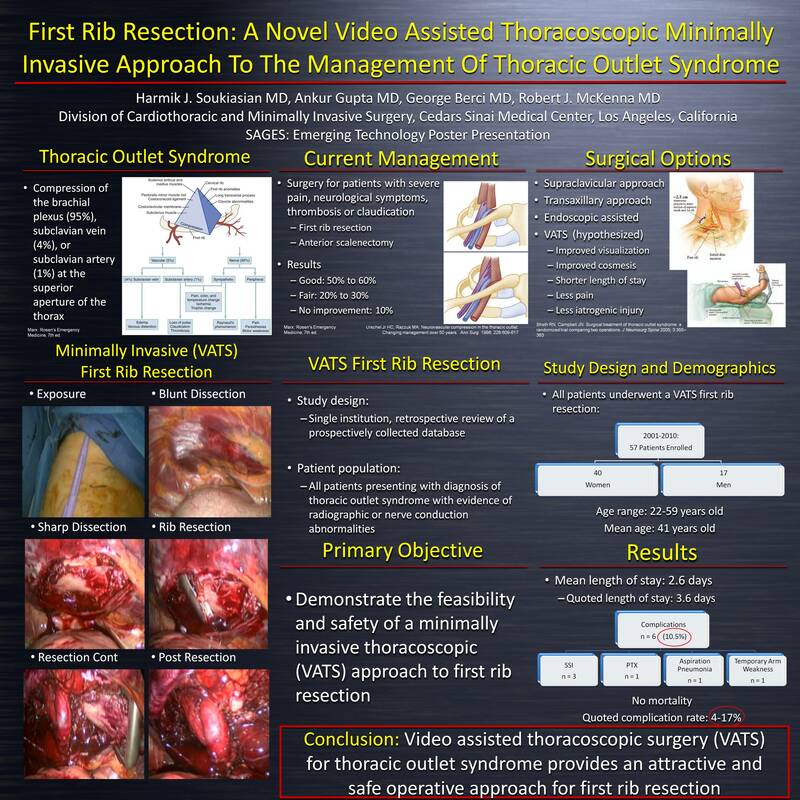 CONCLUSIONS: Video assisted thoracoscopic surgery (VATS) for thoracic outlet syndrome provides an attractive and safe operative approach for first rib resection.